1. Mild nonproliferative retinopathy: This is the early stage of diabetic retinopathy; it occurs when there is swelling in the retina’s blood vessels. 2. Moderate nonproliferative retinopathy: Blood vessels that nurture the retina are obstructed. 3. Severe nonproliferative retinopathy: The retina is deprived from the blood supply. 4. Proliferative retinopathy: This is the final stage of diabetic retinopathy. New blood vessels grow from the retina’s surface—these new blood vessels are very fragile and abnormal; if they leak blood into the retina, the risk of severe vision loss and blindness increases. In order to fully understand what happens in an eye disease, you first need to know how the eye works. The eyeball, which is the surface of the eye, is covered with an outer membrane. The covering of the eyeball, the cornea, is clear and curved—it essentially focuses light and protects the eye. Once the light passes through the cornea, it goes through the anterior chamber, which is constantly filled with fluid called aqueous humor; it then travels through the pupil and then through the lens. Finally, the light passes through yet another fluid chamber in the center of the eye. Once it reaches the center of the eye, it strikes the back of the eye, which is the retina. The retina’s job is to record images, focus on them, and convert the image into electrical signals, which go straight to the brain for decoding. 1. Blood sugar control: Those who regulate their blood sugar levels are at a reduced risk for developing retinopathy. 2. Blood pressure levels: Those with diabetes tend to experience high blood pressure; the rapid change in blood pressure can cause significant changes to the eye (i.e. damage blood vessels in the retina). 3. How long you’ve had diabetes: This is the main cause of retinopathy; the symptoms that cause retinopathy are a direct cause of diabetes. The longer you have had diabetes, the more stress is placed on the retina. The tricky part is your retina may have already suffered significant damage before you even realized any changes in vision. This is especially common with proliferative retinopathy. Symptoms may refuse to surface until it is too late to treat them, which is the primary reason why many people go blind from this disease. 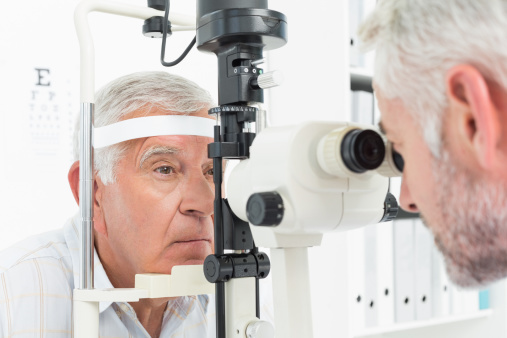 Blurred vision may occur when the macula (part of the retina that provides central vision) begins to swell from leaking fluid from the abnormal blood vessels. This condition is called macular edema. You may see specks of blood or spots floating around in your vision. If you don’t treat the spots, more severe bleeding may occur, which can eventually lead to the loss of vision. You should see your doctor immediately for treatment if you see spots. Keep in mind that you might not need treatment and the spots might eventually disappear, but if the bleeding continues, the blood will seep into the retina and blur the vision. Other possible symptoms may include leaking blood vessels; retina swelling; pale, fatty deposits on the retina; damage to the nerve tissue; and changes to the blood vessels. • Scatter laser treatment can treat proliferative retinopathy. The surgery helps shrink abnormal blood vessels that break through the walls and leak into the retina. The procedure has the doctor place laser burns in the area of the retina; this eventually causes the abnormal blood vessels to shrink. The procedure generally takes two sessions. You may lose some of your vision from the side, but overall the treatment saves the rest of your vision. It is imperative that you regularly have your eyes examined, because this treatment works more proficiently before the fragile new abnormal blood vessels start to bleed. • Focal laser treatment can treat macular edema. The doctor places several hundred small laser burns in the area surrounding the macula, where the retina is leaking. The burns will slow down the leaking and reduce the amount of fluid that pours into the retina. • In some case, a person may also require a vitrectomy, which only occurs if there is a lot of blood in the center of the eye. The doctor will make tiny incisions into the eye, and then use an instrument to remove the gel that is clouded with the blood. The gel is then replaced with a salt solution. Keep in mind if you experience retinopathy, you may be informed that there is no treatment for the first three stages, or until it develops into macular edema. The main thing that people with diabetic retinopathy can do is keep their blood sugar levels, blood pressure levels, and cholesterol levels controlled. “Facts About Diabetic Eye Disease,” National Eye Institute web site; https://nei.nih.gov/health/diabetic/retinopathy, last accessed June 25, 2015. “Eye Complications,” American Diabetes Association web site, November 1, 2013; http://www.diabetes.org/living-with-diabetes/complications/eye-complications/. “Eye Problems and Diabetes,” WebMD web site, February 12, 2015; http://www.webmd.com/eye-health/eye-problems?page=4.